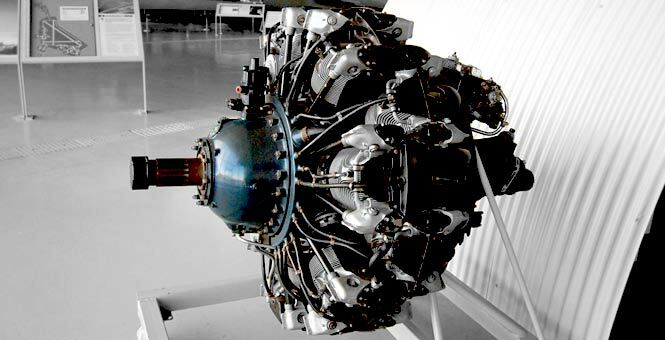 The Pratt & Whitney R-1830 Twin Wasp is a thirty Litre 14 cylinder twin-row air-cooled aero engine designed in the early 1930's and first run in 1932. The R-1830 Twin Wasp proved to be very reliable and easy to maintain, the engine powered numerous WW2 aircraft, there are instances of aircraft losing a cylinder completely in action and still managing to fly back to base. W2 dramatically increased the need for aero-engines and the use of the Pratt & Whitney R-1830 Twin Wasp in fighters, transports, bombers and even flying boats, resulted in a total production of 173,618 Pratt & Whitney R-1830 Twin Wasp's being produced. Numerous variants of the engine were produced with power outputs between 600 and 1,200 Hp. This picture of a Pratt & Whitney R-1830 Twin Wasp is Copyright © June 2014 Siteseen Ltd. We only authorise non-commercial picture use and particularly encourage their use for educational purposes. This Pratt & Whitney R-1830 Twin Wasp picture is not in the Public Domain. 3) Use of this Pratt & Whitney R-1830 Twin Wasp picture, or any of our pictures on websites re-distributing copyright free material is strictly prohibited.